A perfect look for her Thanksgiving! 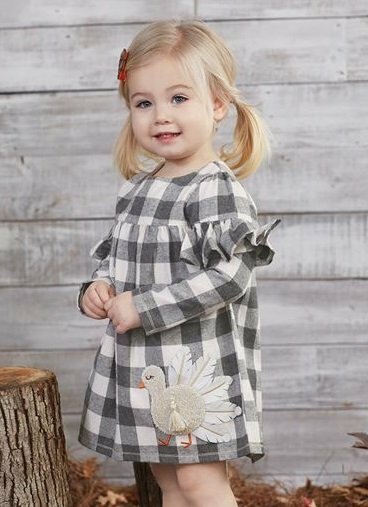 This long sleeve buffalo check flannel dress features side arm ruffles, piped neckline and boucle turkey applique with felt beak, embroidered detail and chiffon feathers. 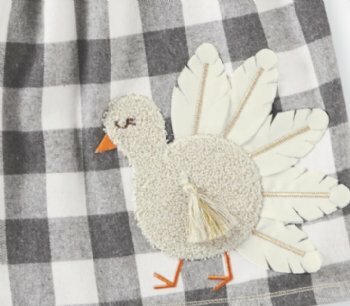 Check out the adorable applique details that Mud Pie is famous for. Sized from 3-6 months to 5T (up to 2T sizes arrives with coordinating poplin bloomers). This item is a final sale.